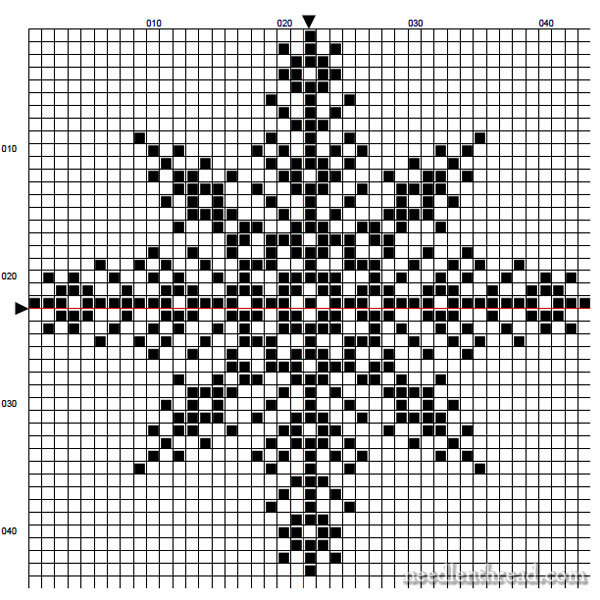 We chatted not too long ago about various ways to work cross stitch on plain weave fabric, and I offered you this snowflake corner design for some holiday stitching. Well, along the same longs, here’s another flake. I figure Monday morning is as good a morning to share it with you! I explained in an earlier article that these simple cross-stitched snowflakes worked on the corner of cloth napkins are a great option for some really simple stitching, for those times in your life when you need something to do with your hands, but not anything complicated. Using one of the three methods we chatted about for cross stitching on plain-weave fabric, I can set up several cloth napkins with motifs in opposite corners, in one corner, or in all corners in a matter of minutes. Then, I slip the cloth napkin, a hoop, a needle, one skein of thread and scissors into a small project bag that’s easy to grab when I have to go somewhere, or that’s equally as easy to access when I’m unwinding in the evening. To tell you the truth, these little projects have been a real life-safer recently! I’ve been working random snowflakes, trees, deer, and the like in white, on the corners of red cloth napkins. They’re so simple, yet they’re elegant and pretty. They’ll make terrific tray or basket liners to go along with Christmas gifts. The funny thing about designing snowflakes is that, once you start, it’s hard to stop. With just tiny variations, you can create a new snowflake, and before you know it, you’ve got a blizzard on your computer screen! To design gridded anything, I use a program called MacStitch, by Ursa Software. They have a Windows version as well. It’s an easy program to use, and it’s relatively inexpensive for this type of software. The company is always developing the software further, too, and the program, overall, has many nice features. There are three different levels of the software you can purchase, from lite to premium, and the premium includes all kinds of fun things, like the ability to add specialty stitches, beads, buttons, and sequins to charts; the ability to change the type of canvas for different views; photo import for making chart designs from photos; designing knitting, lace, and Hardanger patterns, and all kinds of other little advantages. I’ve not personally tested everything the program can do, but for the type of grid designing I dabble about with, it works great. No affiliation here – just pleased with the ease of the program. Here’s the printable for Snowflake #2. If it seems large to you, you can always reduce the size of the chart before you print it. If you’re looking for more hand embroidery patterns, you can find plenty here on Needle ‘n Thread in the Pattern index. If you want a surface embroidery snowflake, maybe you’ll enjoy this one, which is relatively simple, or this one, which is much more complex. And this particular scrolly medallion pattern could work as a snowflake of sorts, too. Thank you for the patterns! Now I need to pick up some nice napkins…. Thank you very much – it’d like to try this with silver on black. Thank you! I’d like to try this with silver floss on black aida. Mary, do you do anything to the wrong side of your stitching on these napkins? I would love to see the wrong side. Hi, Judi – I just stitch as normal, without anything on the back, but I do make an effort to keep the back neat, by avoiding knots and by not traveling the thread on the back long distances. If I have to go more than a couple stitches, I’ll turn the work over and run the needle under the stitches to take me to my next starting point, or I’ll end the thread and start a new one. Hand embroidered table linens and the like don’t usually have any kind of finishing over the back. The back is the back, and it’s not supposed to look like the front. But it’s good to make an effort to keep it as neat as possible. A lovely snowflake design perfect for Christmas decorations on napkins etc, I bet they would look lovely in red, green, white, gold and silver threads on red or white napkins or gift covers. Thanks for the free pattern and for the information on MacStitch I will have a look at the system and cost of this programme. You are so not helping me stick to my rule of not doing any holiday stitching during the actual holidays. I’m keeping you in my prayers. Hope your surgery goes well and recovery is smooth. Thank you for all the things you’ve shared these past weeks. Thank you, Mary, for the big snowflake design. I have been looking for one to adapt for a chicken scratch table runner for a bit now. I have graphed put the ends of the runner with trees in white and red on a green checked background, but I was not satisfied with my center of snowflakes. This one will fit perfectly! Thank you for this one Mary – I’ll be saving it in my inspiration file with the thought that they might make really pretty Christmas ornaments for next year. Thank you for sharing your talent. I always look forward to your email. I hope that your and yours have a Merry Christmas and Happy New Year. Previous Previous post: Keen on Embroidered Monograms? Next Next post: Gone Fishin’!